Weather/Conditions: Pretty cool spring weather with grey skies initially. Some sun broke out later to give some colour - all in all pretty benign day with a bit of winter. 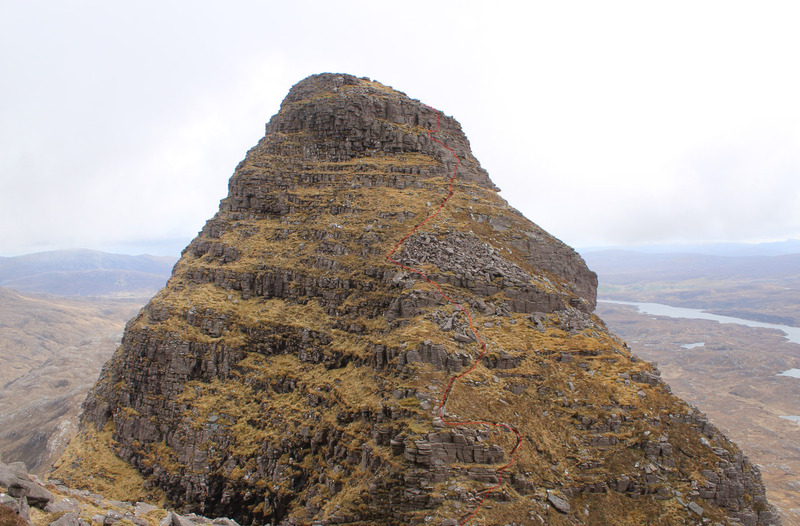 Suilven is one of the absolute great Scottish mountains, appreciated for it's dramatic shape and form - a long wedge of sandstone sat atop a low tableland of Lewisian gneiss. It slightly amazes me that it took so long for me to climb it. 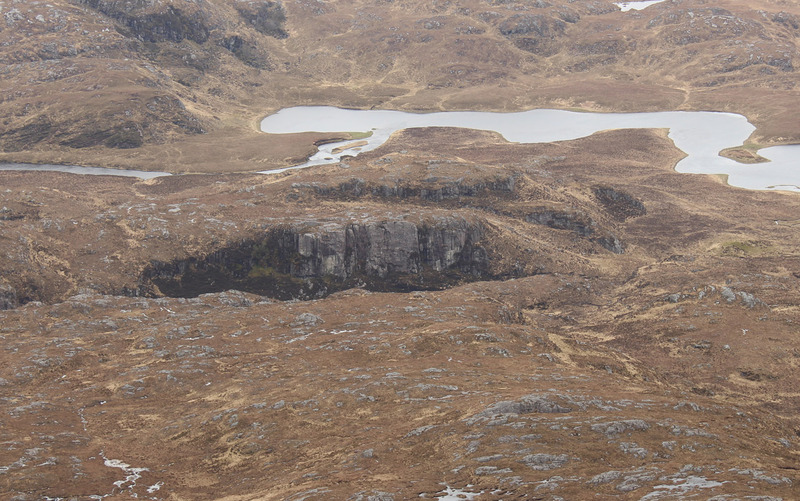 As much as anything, it might be because I visit Coigach and Assynt less, owing to their distance north. But there's always going to be a first time. I drove up the previous evening. The dark roads beyond Ullapool were rammed with deer and I've rarely seen so many. Dad texted me to tell me of aurora, and I was in the right part of the world, after all! 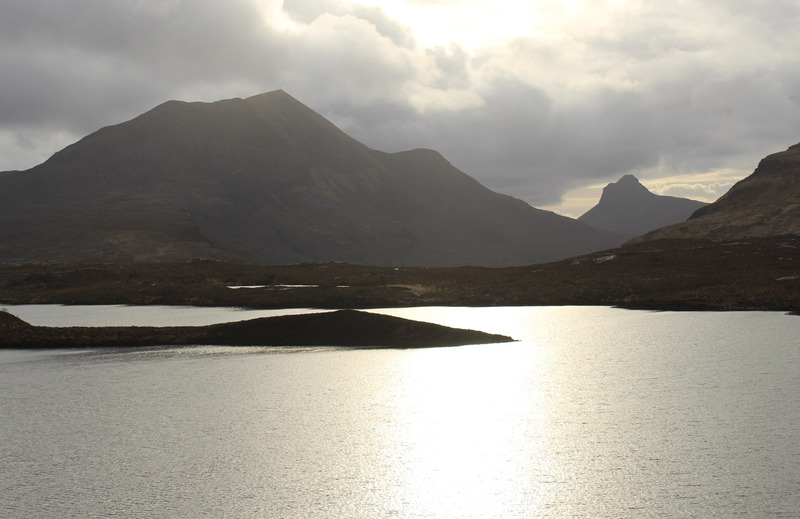 I drove to the summit of the pass over to Kylesku and stood outside the car looking at a faint glowing of the sky that transpired to it, albeit faint. 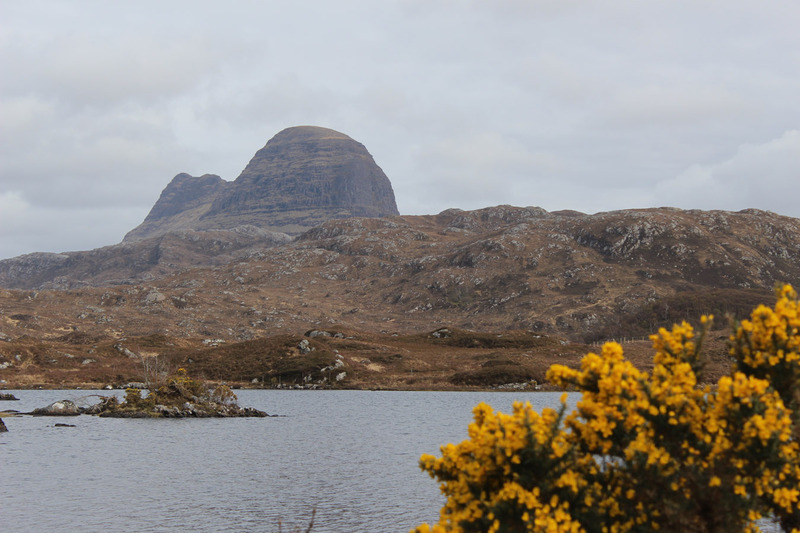 Then I headed half-way to Lochinver and slept in the back of my car in some parking beneath the massive western ramparts of Chuinneag ("Quinag"!). The morning brought light overcast conditions and a dusting of snow on the tops. I didn't feel so much inclination to get moving, and actually shocked myself at how little I was motivated to get going. 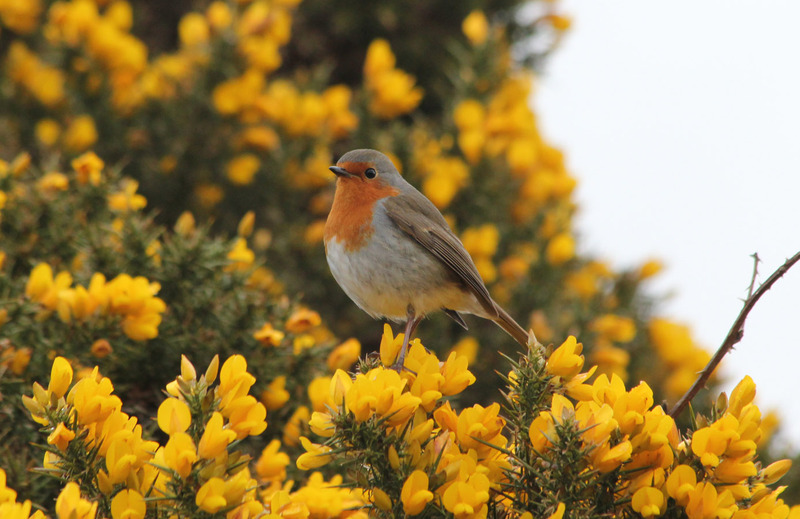 I sat in the car at Lochinver, and then Glencanisp, shooting photos of the birds and distracting myself rather than dealing with the task in hand. 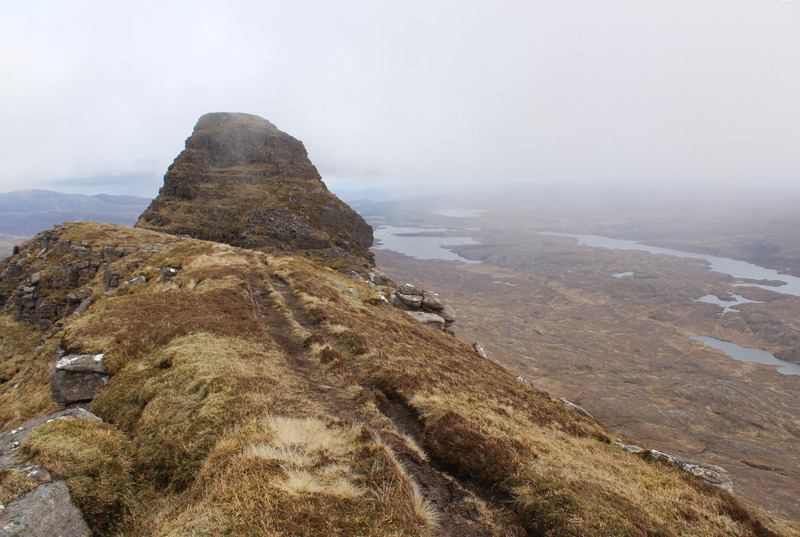 But I must go anyway, because I'm here for Suilven. 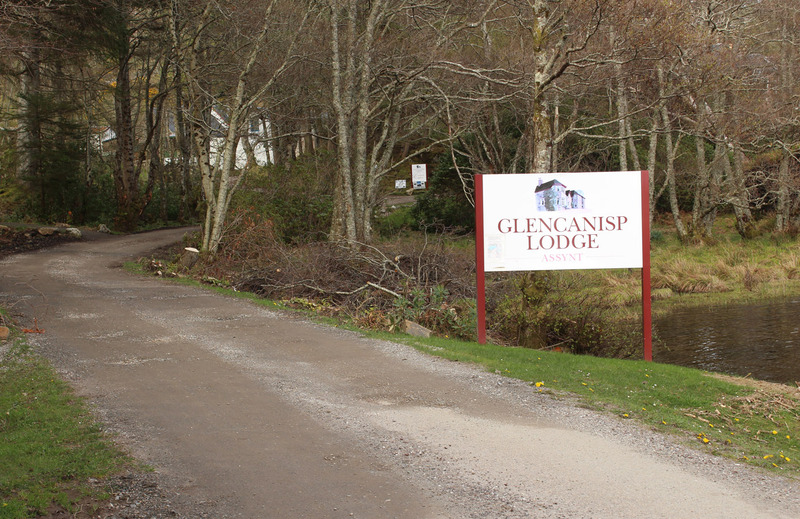 The track begins by Glencanisp Lodge with the first part in view of the lodge, trees and thick gorse. 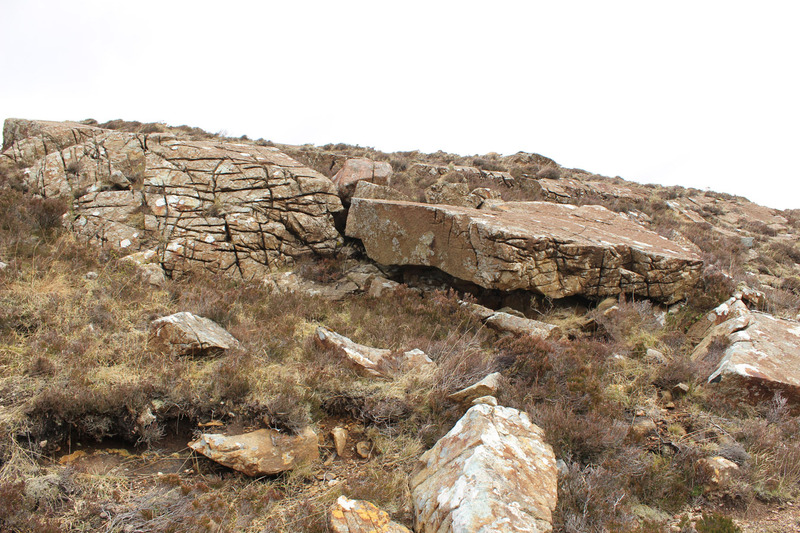 But then it turns a corner and disappears off into the lumpy lands of gneiss. I found this part strangely remote, but you have little sense of where you are geographically and little sense of where you stand. 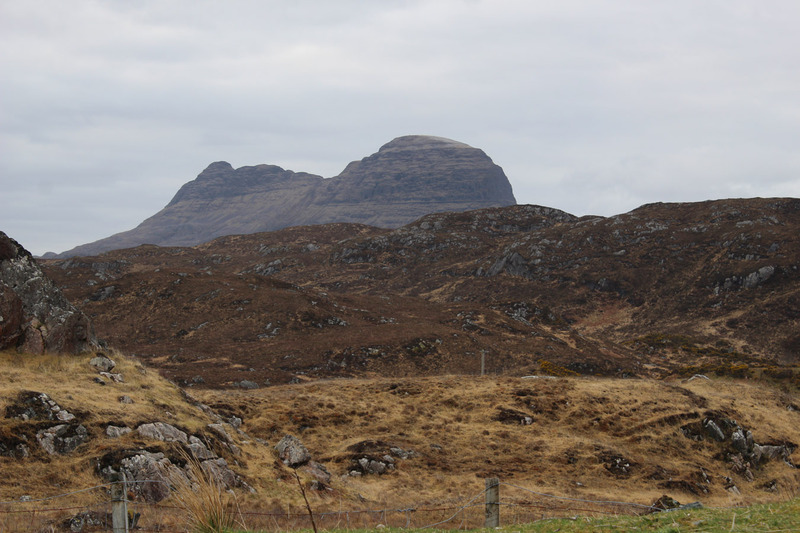 All the while Suilven looms above, growing larger. I stopped in at Suileag for a look. 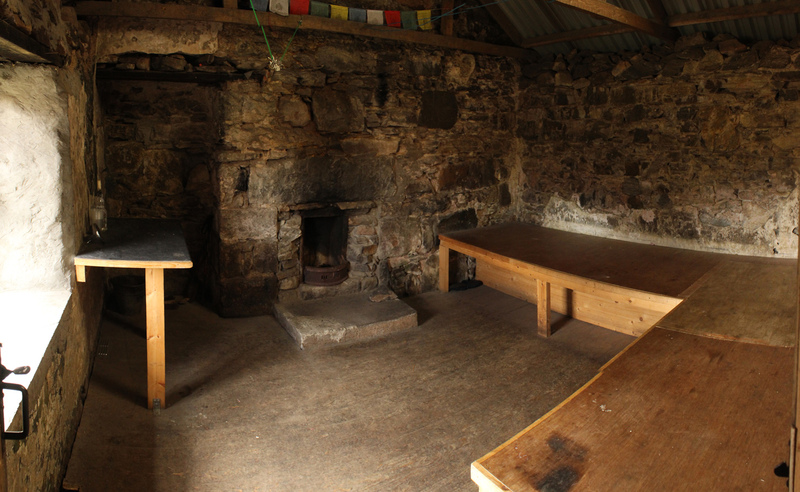 It's hidden up a little corner, and if you didn't know it was there you may walk straight past it. I headed onward pretty soon. 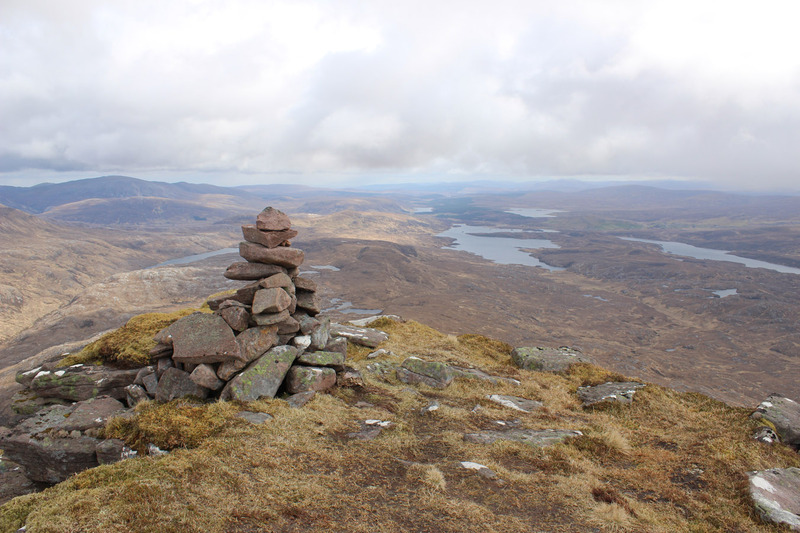 The paths curves, rises and falls for a few more kilometres, then a small cairn marks the turn off up the hillside to Bealach Mor. My visit was, by weeks, just ahead of significant path reconstruction which will control the erosion on what is obviously a really popular mountain. 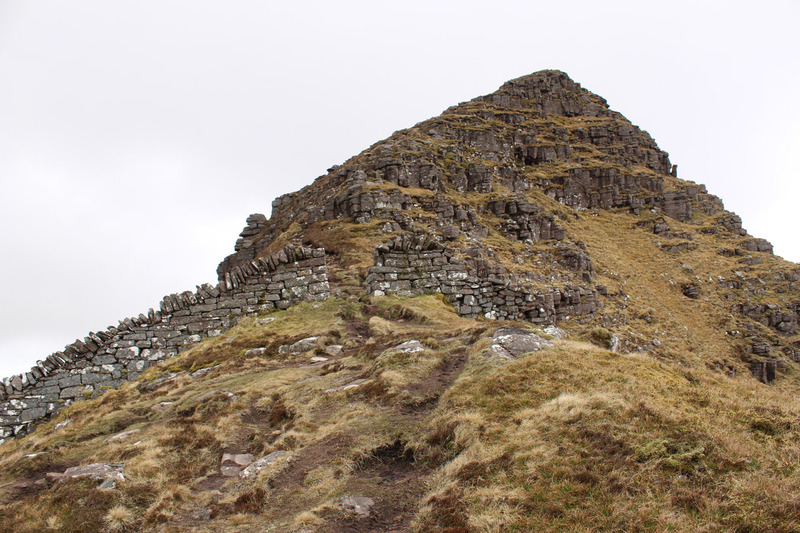 Once I was climbing, it reminded me how much I enjoy the hill walking over the flat walks. 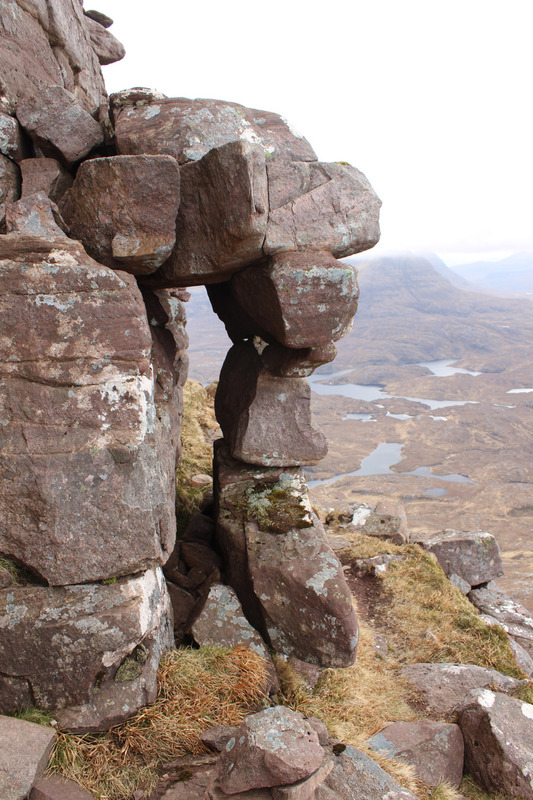 The views open wide, the goal is generally in sight, and you can put the head down and motor up to the summit. 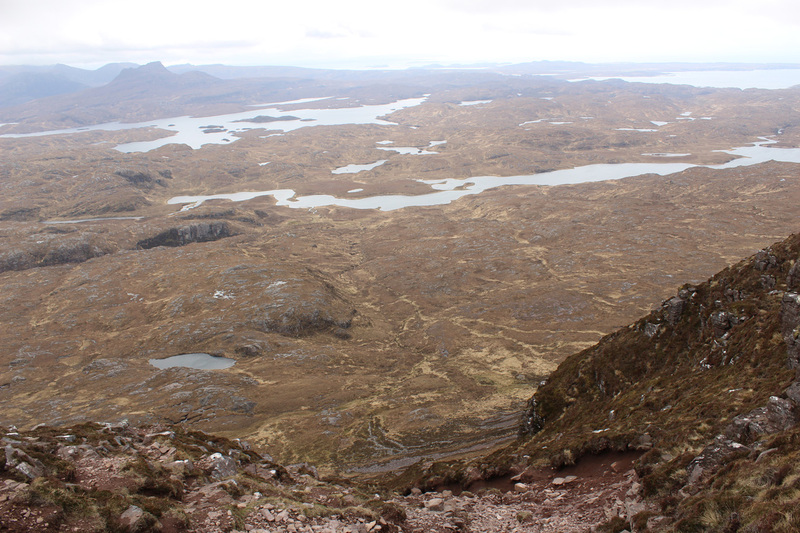 The track passes Loch a' Choire Dhuibh then funnels into the steeper upper mountain. 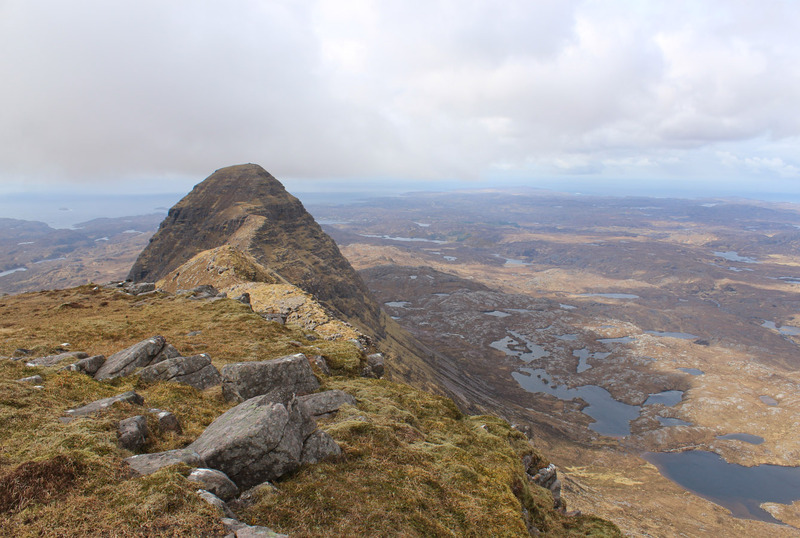 It winds a few times to emerge out at Bealach Mor, on the spine of the mountain, and with each of the two tops of Suilven on either side. 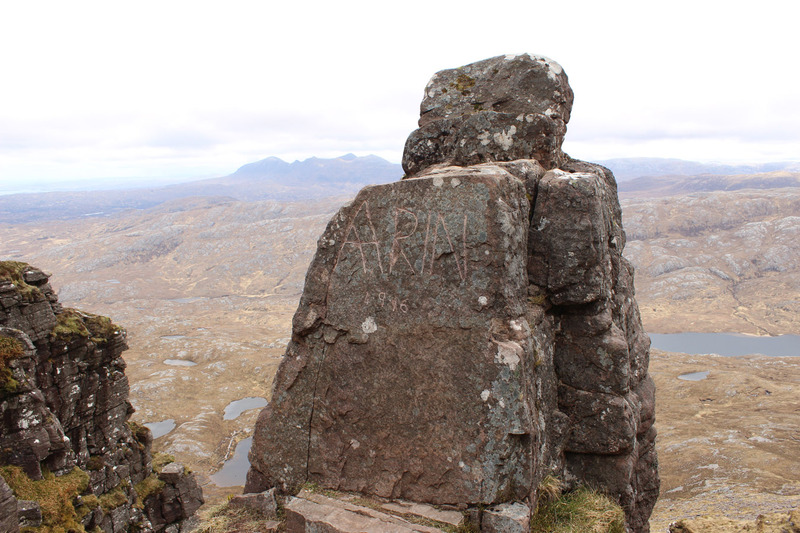 I went for Caisteal Liath first, the higher of the two and the obvious first choice. It's a beautifully exposed place. A path winds upward among a couple outcrops to emerge out on this large, flat summit which falls gently away on either side. 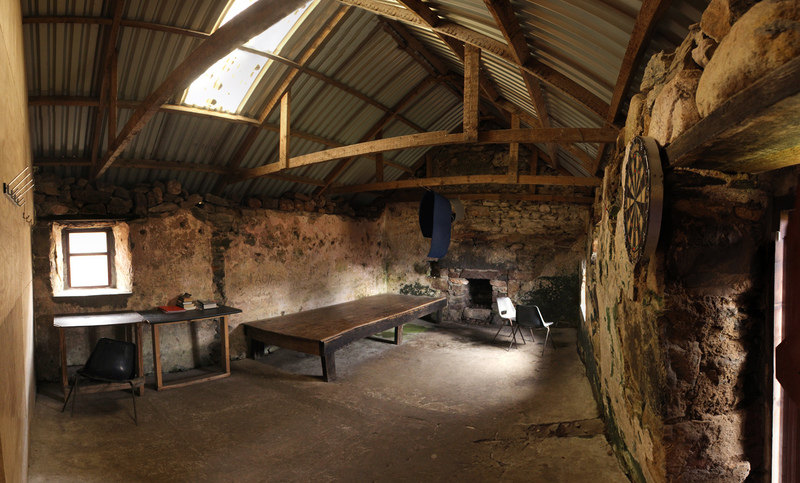 My views were a bit limited by the cloud, so my panoramas lacked the distant views. 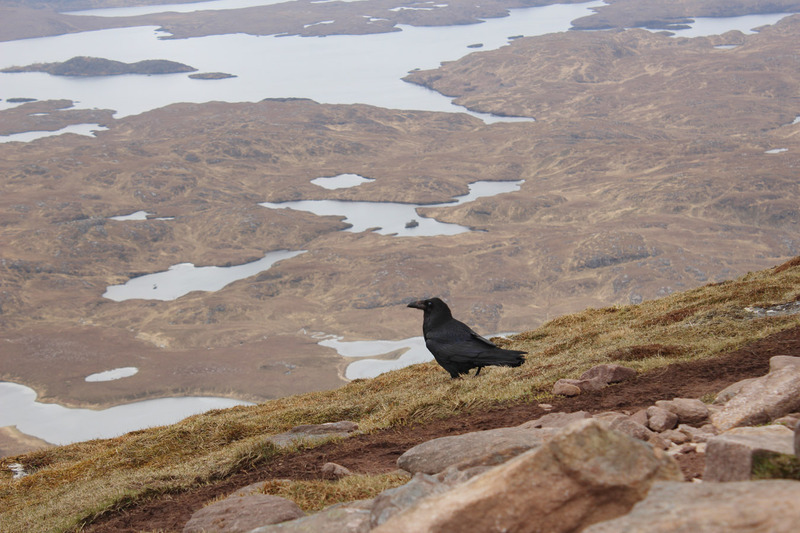 The crows were milling around and having been for a walk down the front of the mountain, I arrived back to find my rucksack pecked open and a pack of cookies flying in mid-air above me. Clever beggers, are those birds! 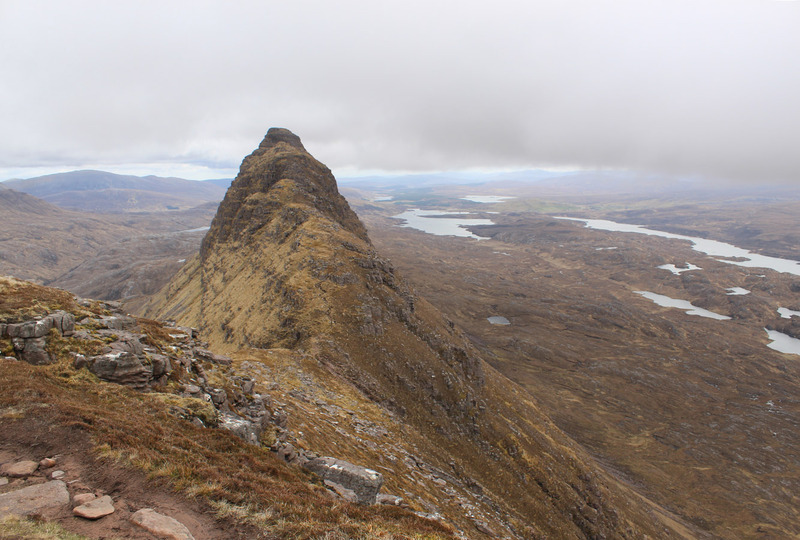 I continued onward to Meall Mheadhonach, which was really the highlight of my day. 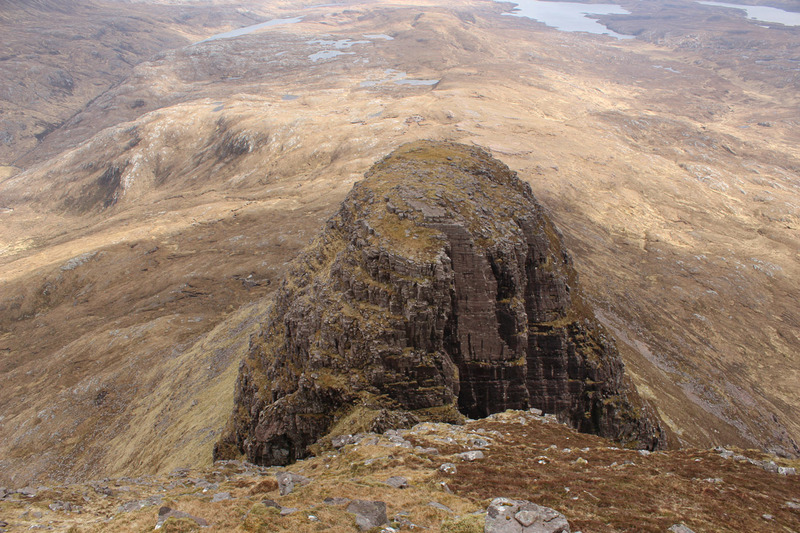 It has three tops; the west top, central top and Meall Beag which is at the eastern end. It's an amazing peak and full of form and interest. 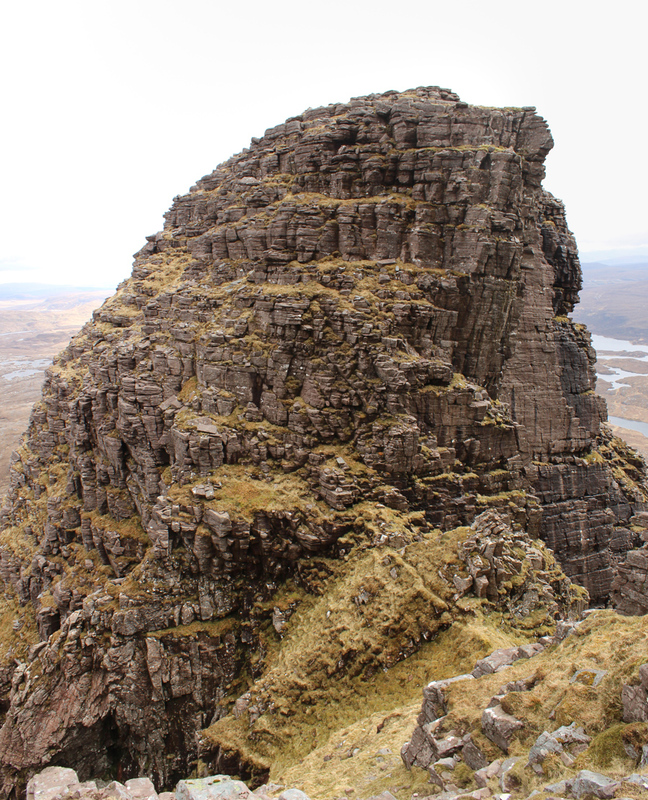 The west top is perhaps a little grade 1 scramble, but the central top crowns the lot. 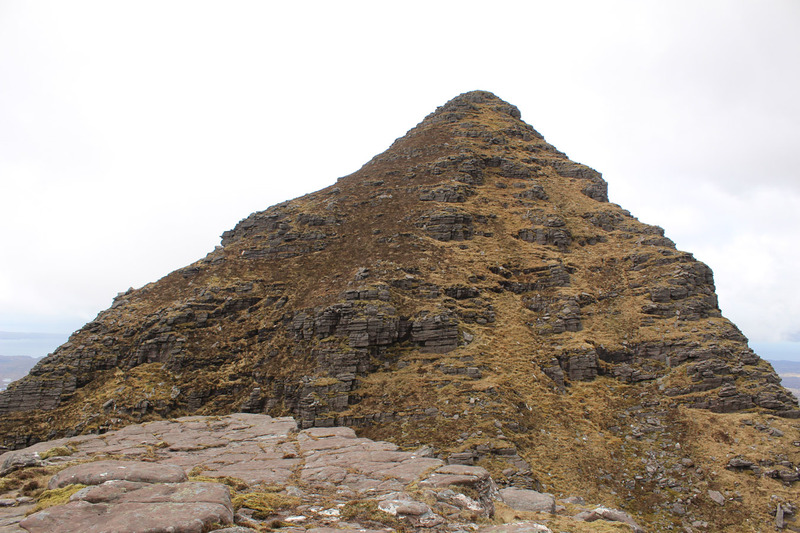 This great triangular peak is sufficiently steep at the top to break out into rock. 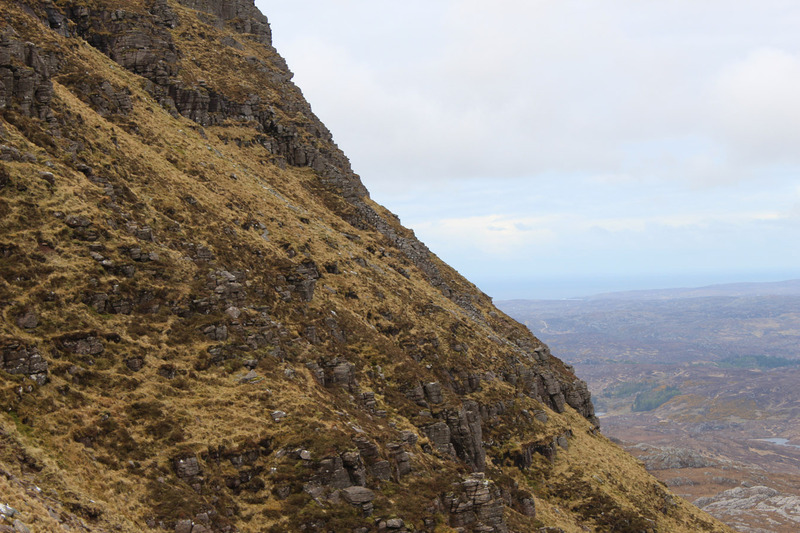 I had a root around these crags, first getting diverted onto the very steep south face, which was bad idea. It seems the best route climbs a rock wall immediately right of a cleaved jumble of rocks - which also looks like it's about to fall over so don't pull to hard! 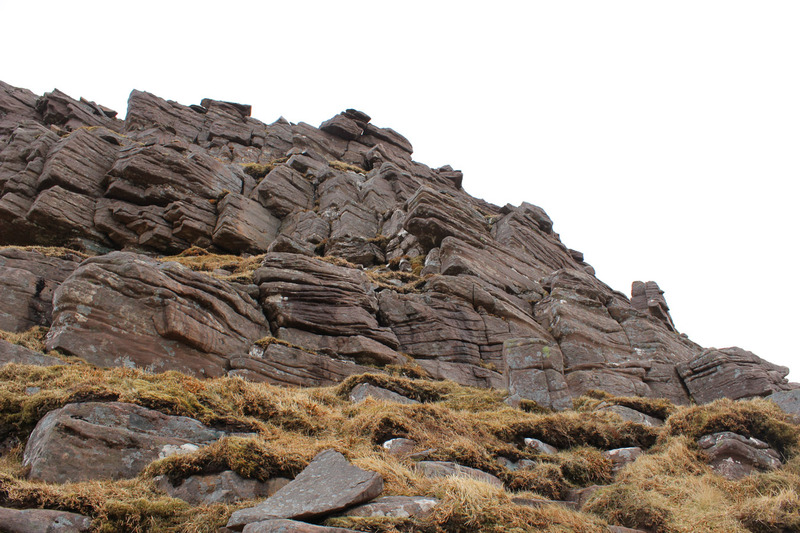 A quick further scramble to the top and I found the flat summit, with a cairn at one end. 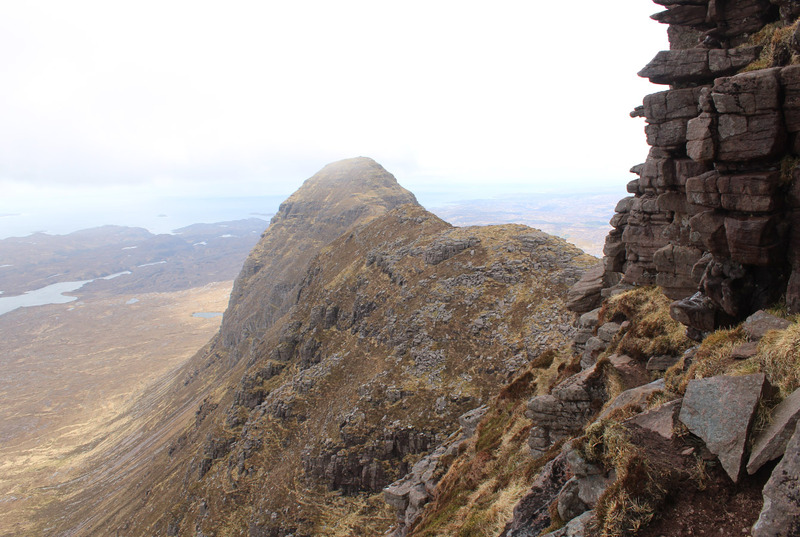 I never originally intended to go to Meall Beag, but now I'd climbed the rest it made sense to go and finish the ridge traverse. And it just looked so cool. 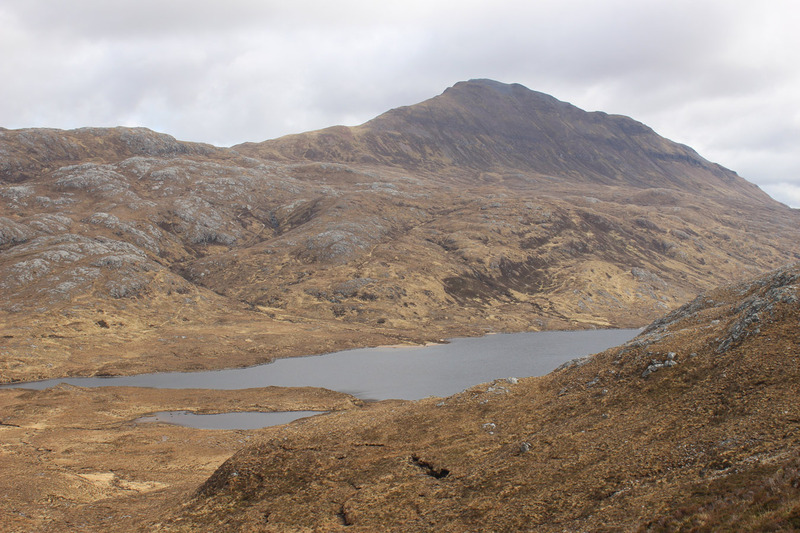 Meall Beag is a diminuitive little top but it's south-west aspect shears off dramatically. It also looked pretty hard to get up owing to it's steepness. But then these things always do when you look down at them from above. In so many cases, getting to the bottom of a face breaks it up into features. 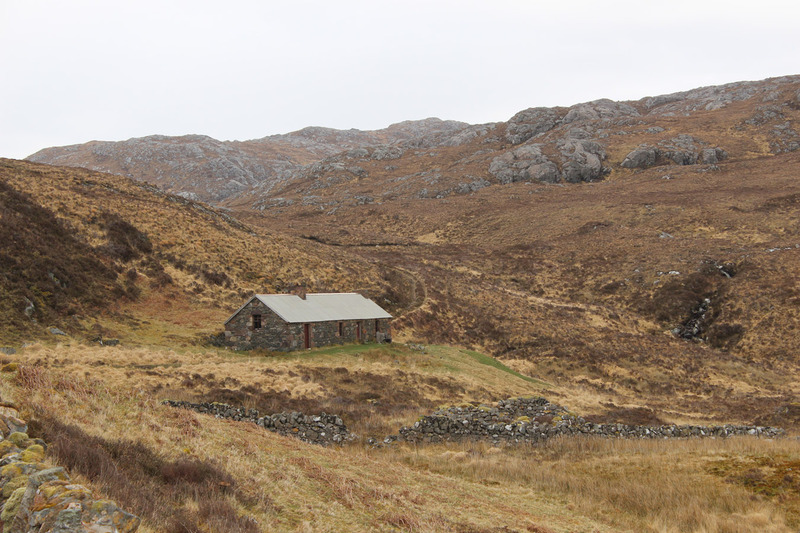 I followed rough ground down to the base of Meall Beag. I've seen this slope described as highly unpleasant, but I perhaps don't feel the exposure in these places anymore. 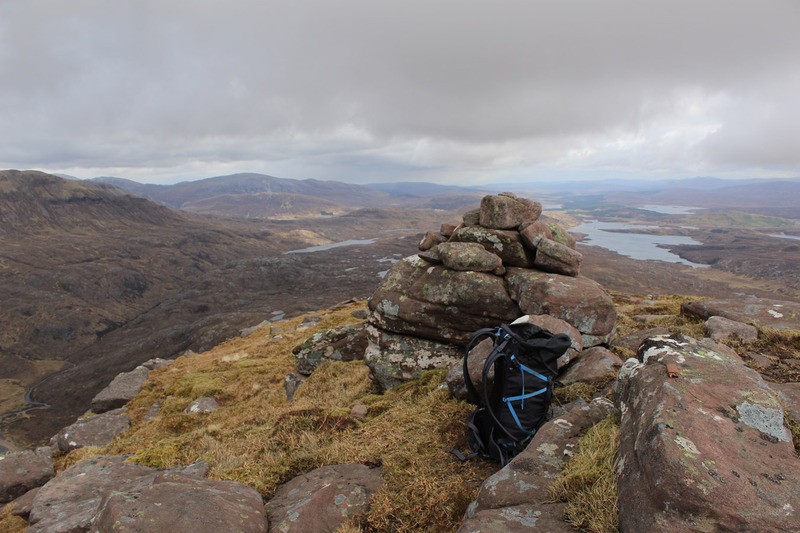 Once I was at the bottom of Meall Beag, the ground unravelled itself and I was at the cairn shortly after. It is a highly satisfying, impressive little peak in itself. 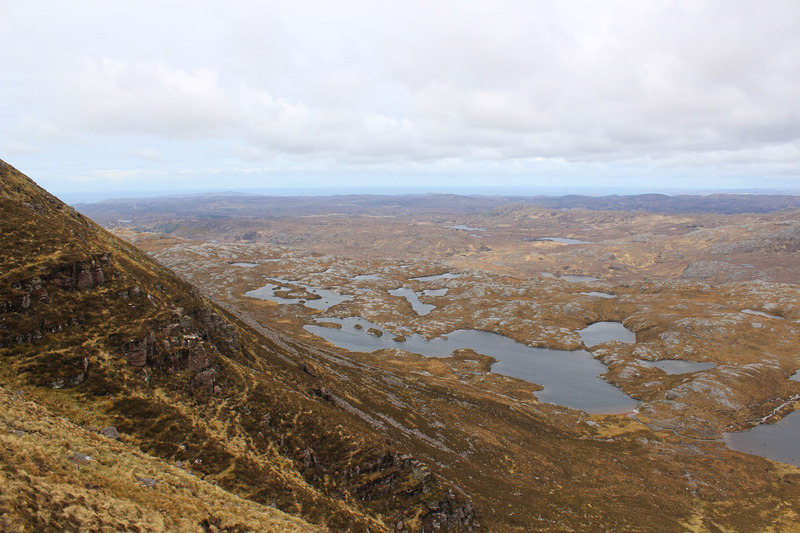 I retraced my steps over Meall Mheadhonach. Hail showers were blowing in, I was climbing down with hail blowing up and across. This is also the way I located the best route as it's not so obvious from below! 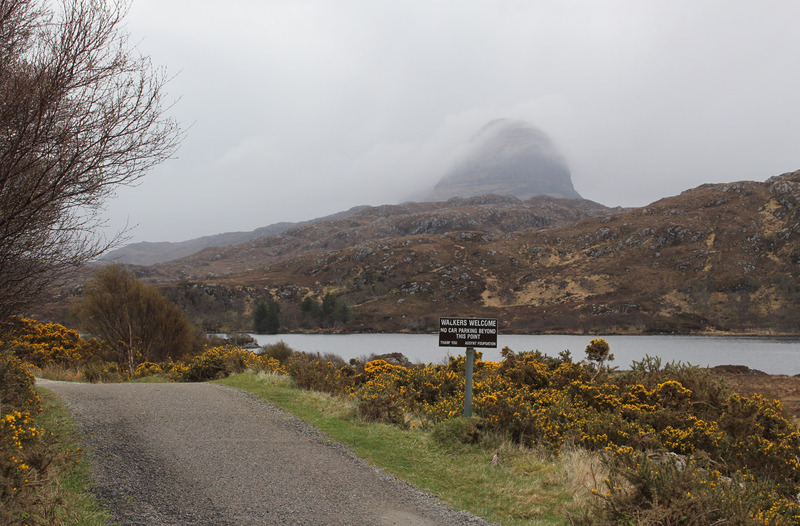 Caisteal Liath seemed on the verge of being consumed by mist, and I raced back down to Bealach Mor. I jogged down the path, and out to the approach track. The hail showers never came to anything and the afternoon was just gently overcast for the final walk back out to the car. Finished with my walking, I drove south as night fell, finally going to sleep in the Ben Wyvis car park. The following morning; Little Wyvis.